The Monday night United States Football League matchup on May 9, 1983 featured the New Jersey Generals, with prize rookie RB Herschel Walker, against the visiting Birmingham Stallions. After a slow start, Walker came into the tenth week leading the new league with over a thousand yards on the ground. However, while they had won the previous week, the Generals were only 3-6 thus far under Head Coach Chuck Fairbanks. Other than Walker, the offense was ordinary and the defense mediocre. 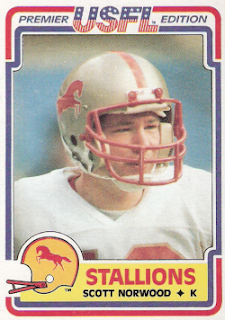 The Stallions, under Head Coach Rollie Dotsch, were 4-5 and suffered with inexperienced Bob Lane and Reggie Collier at quarterback, but utilized an effective running back-by-committee approach. The young defense tended to keep opposing teams out of the end zone and had given up a total of just 21 points over the previous three contests. There was a crowd of 38,734 in attendance at Giants Stadium in the New Jersey Meadowlands. After the Stallions were forced to punt on their initial possession, the Generals took the early lead thanks to a 37-yard scoring pass from QB Bobby Scott to WR Tom McConnaughey on their second play from scrimmage at 2:22 into the first quarter. Unfortunately for the home team, that would prove to be the high point of the evening. Birmingham came back with an 84-yard drive that culminated in a one-yard touchdown run by RB Bill White. Two more time-consuming drives led to field goals by Scott Norwood in the second quarter. The second came with 18 seconds remaining and made it 13-7 in favor of the Stallions at the half. But while the score was close, Birmingham had dominated time of possession by holding onto the ball for just over 22 minutes. As a result, Herschel Walker had just five carries for 19 yards. Norwood kicked a 31-yard field goal with just under five minutes to play in the third quarter to extend Birmingham’s lead to 16-7 and then recovered a fumbled kickoff return by RB Thomas Lott. That set up his fourth field goal, from 37 yards. Norwood booted a league-record fifth field goal in the fourth quarter from 25 yard but just missed a sixth from 41 yards. It was more than enough for the Stallions, who won comfortably by a score of 22-7. Birmingham dominated in total yards (414 to 154), with 242 of that total coming on the ground, as opposed to just 38 yards for the Generals. The Stallions also were dominant in first downs (24 to 8) and time of possession (43:28 to 16:32). The visitors didn’t turn the ball over, while New Jersey did so once. Four Birmingham runners outrushed Walker – Ken Talton (64 yards on 20 carries), Earl Gant (12 attempts for 56 yards), Bill White (15 carries for 53 yards), and Cornelius Quarles (11 for 47). Bob Lane was successful on 13 of 19 passes for 182 yards. WR Jim Smith topped the receivers with 5 catches for 78 yards. Scott Norwood, the rookie placekicker out of James Madison who had failed to catch on with the NFL’s Atlanta Falcons, was the scoring star with his five field goals in six attempts. For the Generals, Herschel Walker gained just 28 yards on 11 carries. Bobby Scott completed 7 of 16 throws for 121 yards and a TD with none intercepted while backup Gene Bradley was successful on just 2 of 6 for 11 yards. TE Sam Bowers caught 4 passes for 62 yards. The Stallions went on to finish fourth in the tough Central Division with a 9-9 record. New Jersey ended up third in the Atlantic Division at 6-12. Scott Norwood’s five field goals remained the USFL record, although it was tied twice – by David Trout of the Stars in 1984 and Brian Franco of Jacksonville in ’85. For the 1983 season, Norwood was successful on 25 of 34 field goal attempts and added 34 extra points to total 109 points, which ranked fourth in the league. Herschel Walker bounced back with 87 yards the next week on his way to topping the circuit with 1812 yards on 412 carries (4.4 avg.) and 17 touchdowns. He also led the Generals in pass receiving with 53 catches for 489 yards and another TD.